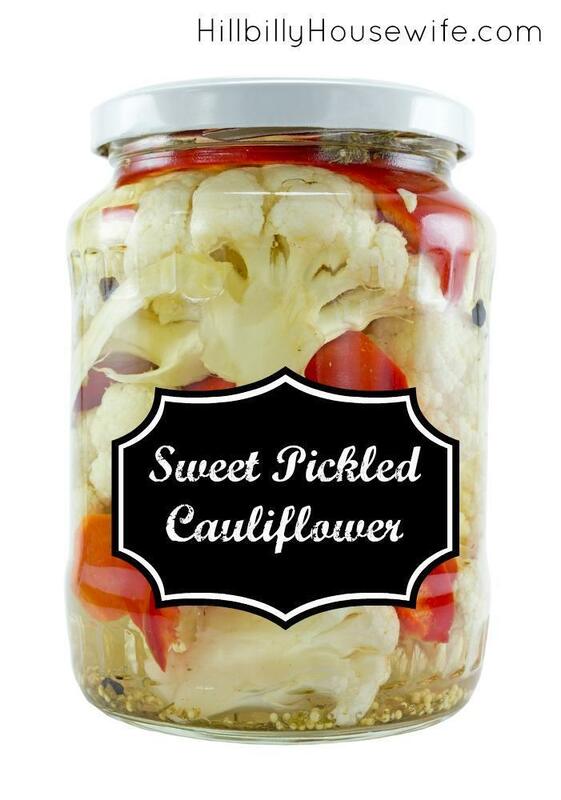 Cauliflower is coming into season and a simple way to preserve it is to pickle it. We like sweet pickled cauliflower as a quick side to go with sandwiches as lunch or to add some extra flavor to almost any main entree. It goes especially well will any type of grilled meat dish. Remove what’s left of the outer leaves of the cauliflower and cut it into large bitesized chunks. You can cut off and discard most of the thicker stems, but keep the smaller ones in there. Throw the pieces in a large bowl of water (or just fill up your sink) and give them a good washing. Scoop them into a strainer and allow the water to drip off. Get out a large stock pot and fill it it about half full of water. Put a lid on and bring the water to a boil over high heat. When the water comes to a full boil, gently add the cauliflower. Boil it for a good 5 minutes, then remove the cauliflower and discard the water. Pour the vinegar, sugar, syrup and spices in the pot and give it a good stir. Add the peppers and onion as well and bring the mixture to a boil over medium heat. Add the cauliflower back in once it is boiling and simmer the mixture on low for 5 minutes. Carefully pack everything into pint jars that are clean and hot. To heat them up, I set them in some very hot water while the cauliflower cooks. I put some of the vegetable mixture into each jar first (using a slotted spoon), then top each jar off with enough of the vinegar mixture to make sure the vegetables are covered. Seal the jars and process them in boiling water for 5 minutes. Allow them to cool, then check the lids to make sure they are tight and store them in your pantry. Any jars that don’t seal properly should go in the fridge (after they are cooled) and eating within a week or two (the pickled cauliflower, not the jar should be eaten 😉 ). Cut cauliflower in florets. There should be 2 quarts. Cook in a small amount of water 5 minutes; drain. Combine remaining ingredients and bring to boil. Add cauliflower and simmer 5 minutes. Pack in clean, hot, pint jars and seal. Process in boiling water bath 5 minutes.